Hello, hope you are all well. 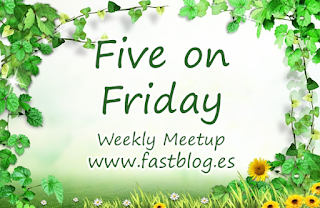 I'm joining with 'Five on Friday' with some photos of my week. The last few weeks some of the family have been fighting colds. unfortunately for teen 1, it progressed to asthma too. Thankfully the asthma nurse was working that day and he received a week of steroid tablets. It's quite scary when you can't breathe, thankfully he didn't have an actual attack but was hitting less than half the expected norm on the peek flow chart. He wasn't in a fit state for college all week but caught up on work emailed from tutors. He also made good progress through the Jonathan Creek box set whilst resting. M surprised me with some flowers last week, I love the rich red berries in the bunch too. Looking at the leaves (oak tree leaf shape), they look like Chrysanthemums. It's years since I worked in a florist, nursery garden centre. The lilies have had their pollen removed, as beautiful as they are, and I know QT doesn't usually jump on the table, but they are poisonous to cats. M and teen 2 have been planting up 3 new hanging baskets. Each basket has a silver and a gold edged ivy plant with the winter flowering pansies and some tete a tete daffodils which will flower in early April. Becky if you're reading this, I loved your baskets and they were the inspiration, thank you. It's just nice to look out the kitchen window and see some beautiful flowers hanging in baskets. QT, soaking up the last of the sunny warm rays. He's such a fluffy boy and totally knows how to take life easy. He's been leading us in a merry dance of 'you stock up the cat food - then I'll not eat it after 4 days'. Today after shopping in town I called into the surgery for my flu jab. I've never attended a clinic for this before but thought I'd take the first of the 3 available dates listed. The queue was very long but swiftly dealt with, so with an aching arm at least I'll be invincible over the winter. Having had flu once over Christmas 2 years ago, it's something I'm very pleased to avoid. I'm not sure how the eligibility is worked out but the asthma nurse invited me to attend. Last year she went ahead and gave me the jab as part of the asthma review. Last night was the local book club discussion, we discussed two books both of which I hadn't finished reading. I abandoned Killing Kate halfway but continued scan reading until the end to catch the gist for the questions. A Street Cat Named Bob, I saw the DVD which though doesn't always follow the books well, I'm glad I got to watch it beforehand. I'm half way through this one and want to finish it before starting the next one. 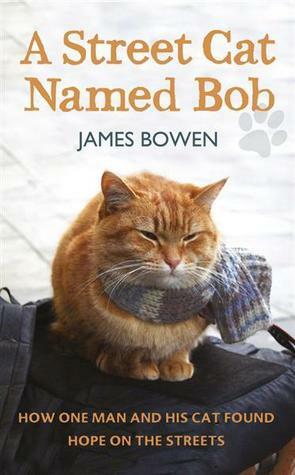 A Street Cat Named Bob - Questions (Book choice for August). 1. Talk about the strange connection that exists between humans and animals. What makes us bond with one another? James was barely able to care for himself, as he admits, so what prompted him to undertake the care and added expense of a sick animal? 2. Bowen says that Bob attracted people and motivated them to offer money, far more generously than when he was playing on his own. What is it about animals—but not people—that brings out people's kindness charity? is there something strange about that? Isn't that backwards? 3. How do you react to the homeless? Do you ever stop to talk, learn their story, offer money, a word of encouragement, a cup of coffee? Has this book made you see homeless people differently? 4. Bowen's story, of an animal that changes one's life, is exceptional but not unique. What is it about animals that can heal the human soul? 5. How did James end up on the streets of London? What part did his mental health and/or his family history play? How responsible is/was James for his troubled life? To what degree are any of us responsible for the path our lives take? 6. Would you read the other books in the series? 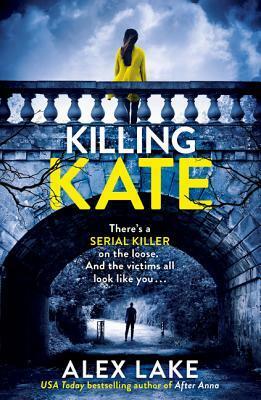 Killing Kate – Questions (Book choice for September). 1. Leaving aside the whole issue of domestic violence – which as a group we've discussed many times before, how did you feel whilst reading this book? eg did you enjoy the book, feel uncomfortable etc. 2. Was the plot with a serial killer, having an un-convicted past, believable? 3. Were there any red herrings, was there a twist? 4. What are your thoughts on how Alex Lake has written the book eg the characters – did you feel sympathy with any of them. 5. Was the writing fast paced or slow and dull? Kept you guessing 'till the end. If you were to write a blurb for this book or even a review, what would you say? 7. Would you read any more of Alex Lake's books? Revisiting The Haven in September. You may remember a previous walk here where I mentioned Samphire growing on the beach soon. M and I visited The Haven on Thursday for a walk, it was very warm, bright and sunny and as usual hardly anyone about. Here are a few photos with what's left of it now, covering the beach in a reddish carpet. Here is some info about Samphire if this interests you. Do leave a comment if anything is of interest or if you've read one of the books. Have a good week and thanks for stopping by. Sorry to hear about your son, hope he is feeling better. Beautiful flowers and the hanging baskets were a joy. The winds here are too strong for baskets, they wouldn't survive long. Your flowers are beautiful. I love lilies but all the pollen annoys me, it gets everywhere, I always forget to cut out the stamens. Hope your son is feeling better now and that your arm is a little less sore, I suppose it's worth it rather than getting flu. Cats are so fickle, they seem to change their minds about things just to annoy us, but QT certainly looks comfy laid in the sun.